The Euro-Focus has one, HUMMER has one, Mercedes has one, Porsche has a few of them, Nissan has one, so why shouldn’t Mazda have one too? Introducing the Mazda Roadster black-tuned edition. It went on sale in Japan this week. So why isn’t the car black? Perhaps it is just the roof that is going to be black? And it isn’t just any roof, it is a hard top roof, and not only that, it is a retractable hard top roof! That, according to Mazda, qualifies it for the black-tuned edition. Not enough you may think? OK, let’s throw in some black door mirrors, and some black 17inch alloy wheels (actually metallic grey 17inch alloy wheels, but closer to black than red right?). Not enough black you still think? OK, let’s go inside. How about black leather seats and a black leather steering wheel? No? 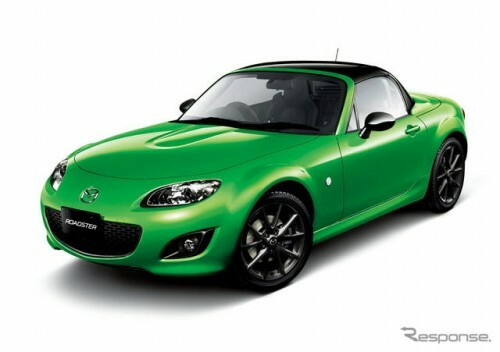 Well the final touches by Mazda to make this Roadster RS RHT into the official Mazda Roadster black-tuned edition: give them three possible colors, “spirited green metallic”, “velocity red” and “crystal white pearl”. (Yes, no black version! But this is the black version?!). Buy one new or get one in the auctions soon, again, near new is cheaper than new-new! Previous PostJohn Cooper Works Mini Coupe on sale in Japan from Dec.
Next PostTsunami used cars for sale?